"A nice cup of tea and a sit down"
After an eventful trip to India, the three intrepid inspectors landed in Kuala Lumpur in need of some respite/shopping. However, we can't be all play and no work so we decided to put our backs into a high tea marathon at the Ritz-Carlton, Kuala Lumpur. Arriving a full hour too early, we were invited to have a nice cup of tea and a sit down until the food begins (from 3 - 5pm). We all agreed that this was most excellent service, fully anticipating a "computer says no" approach to early arrivers and so happy to be able to rest one's tootsies and build up an appetite with some jasmine tea. Part of the charm is in choosing and for your process of discernment, the entire range of 42 teas is wheeled around along with vials so you can get a whiff of the good stuff before getting the usual. 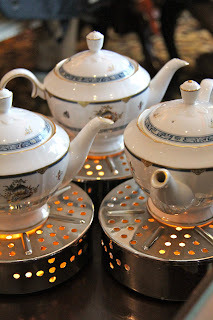 The teapots and teacups are stately china, and a nice touch is the tealight teapot keeper-warmerers. When 3pm rolled around we were greeted by the familiar sight of the three tiers of treats, the top consisting of mini chicken pies, quiches, plain scones and apple caramel scones - a new twist on an old favourite. The second tier was gourmet open sandwiches, artfully arranged, though if one was to be picky (and one is) we might suggest that these may not have been made in the recent past. The bottom tier was full of jewel coloured sweets, cheesecake flanked in dark slabs of chocolate and studded with fresh mango pieces and raspberries! The way to anyone's heart to be sure. There was also raspberry macaroons, orange eclairs and pastry cups with fresh berries and gold leaf, to put that extra sparkle in your step. 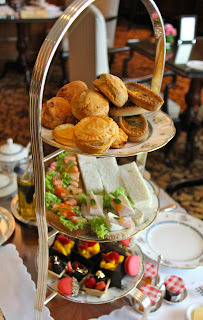 All in all, a great high tea in the surrounds you'd expect from the Ritz-Carlton - the service was really superb and all for just 69MYR (A$23) - no dinner required.